Happy Hallowe'en!! It's rainy and dark here in Galway - not much chance of a roaring bonfire, sadly. My Hallowe'en Brack recipe is here for any lastminuters. We had roasted pumpkin and peppers with garlic last night - mmm. 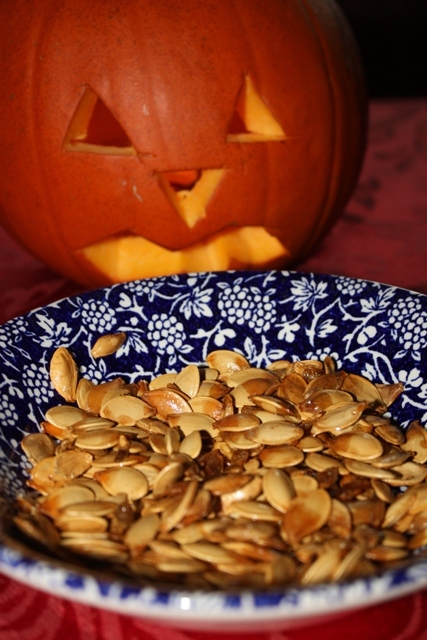 I was looking at the pumpkin seeds as I carved the Jack O' Lantern, thinking, Don't throw away those pumpkin seeds, eat them instead! OK, it turns out it involves a bit of work but it's nice work. Firstly, pick all the pumpkin flesh from the seeds. Rinse them in a colander. Dry them overnight on a baking tray. Sprinkle with olive oil and salt and place in oven. Roast for 35 minutes and you have a healthy, yummy snack. If you don't eat the seeds straight away, store in an airtight container once they have cooled down.